The Kids army assault vest which is super fun for children. 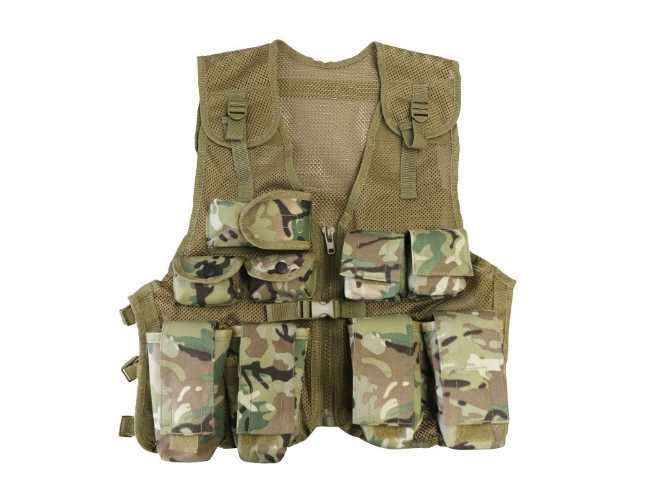 The vest can be used outdoors for fishing, airsoft , or any other activity that kids enjoy doing.It is very authentic looking and based on the real army assault vests.Made and designed using 1000 Denier Cordura material which makes the vest tough, durable and able to take what is thrown at it.It has many extras like 9 pockets that resemble ammunition pouches and will keep safe any bits and pieces that is used in games. It is a tough vest with adjustable straps for a good fit and is waterproof.The children's assault vest comes in a camouflage which is based on the Armies own camouflage material. It is one size and fully adjustable. Fully adjustable as it is one size.